Known as "The Village by the Sea," Carlsbad, California continues to be the destination for people who enjoy the temperate climate, Pacific Ocean and clean air. Located less than 30 minutes from downtown San Diego, Carlsbad and its residents welcome you to take advantage of all this local community has to offer. In addition to golfing and dining at The Crossings at Carlsbad, there are several attractions and activities to keep you fully entertained. LEGOLAND® brings out the hero in everyone. 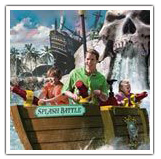 There are more than 50 super rides, shows and attractions for the entire family. There’s fun for everyone, including even the youngest guest. The Flowers Fields is the only commercial ranunculus field in the world that is open to the public. The Flower Fields entertains and educates visitors of all ages from morning to dusk with flourishing gardens and community activities. The Museum of Making Music is a 501(c)(3) non-profit organization located in Carlsbad, California. It opened to the public on March 5, 2000. Its mission is to "celebrate the rich history and encourage the future of music making." Carlsbad Premium Outlets features 90 outlet stores of top brands and is located at 5620 Paseo del Norte, Suite 100, in Carlsbad, CA.